Making yourself heard in traffic is essential, but the horn that comes as standard in most motorbikes sounds little better than the puny one in a scooter, which means that at speed or in heavy inner city traffic cagers might not hear you when you most need to make them aware of your presence. 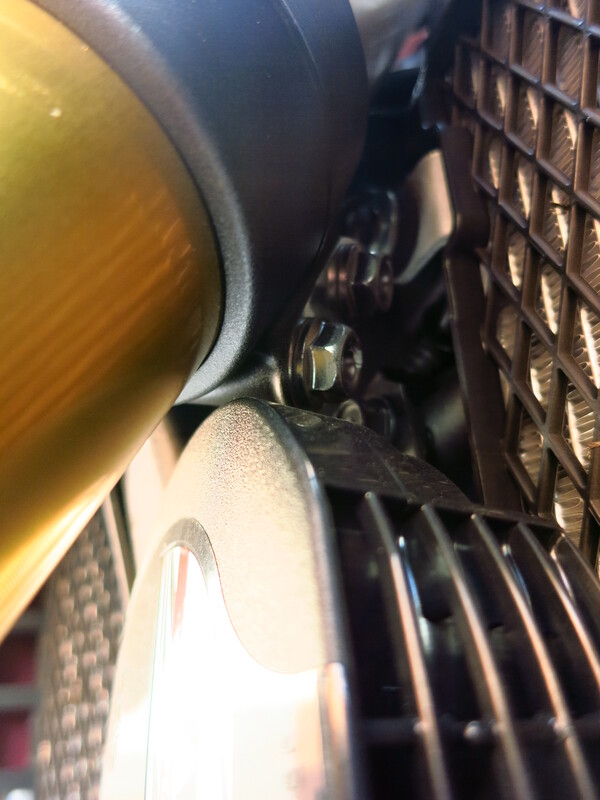 Replacing the horn in the V-Strom was something that was on my to-do list forever but I never got round to do it even though it was one of the easiest bikes in which to install one of everyone’s favourite horns – the Stebel Nautilus, as it has plenty of room. Then I got the Super Ténéré and the horn was even more ridiculous, which turned out to be not because it was complete rubbish as I thought but because it was on its way out. It died about a month after I bought the bike. Time to finally fit a proper horn, then. 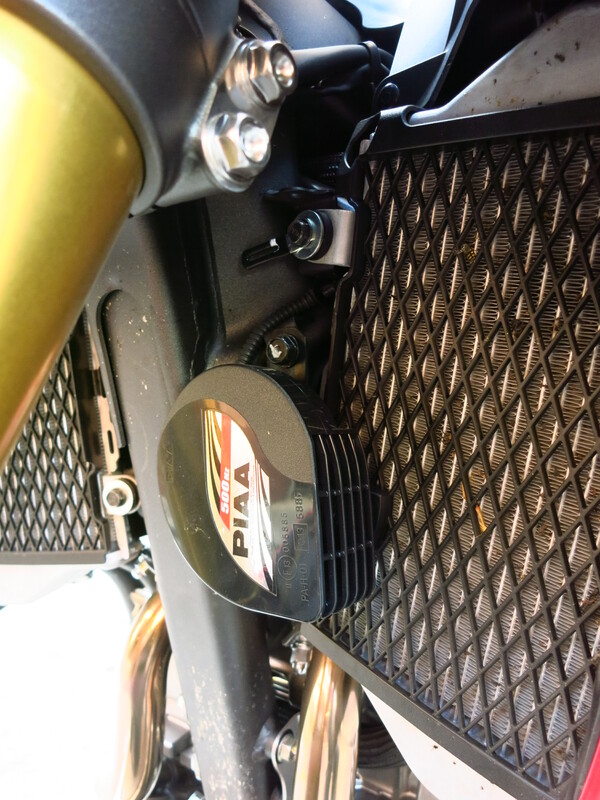 Space in the Super was a lot more restricted than in the V, and after some thorough research on several forums I choose the PIAA Powersports Slim Line horn. 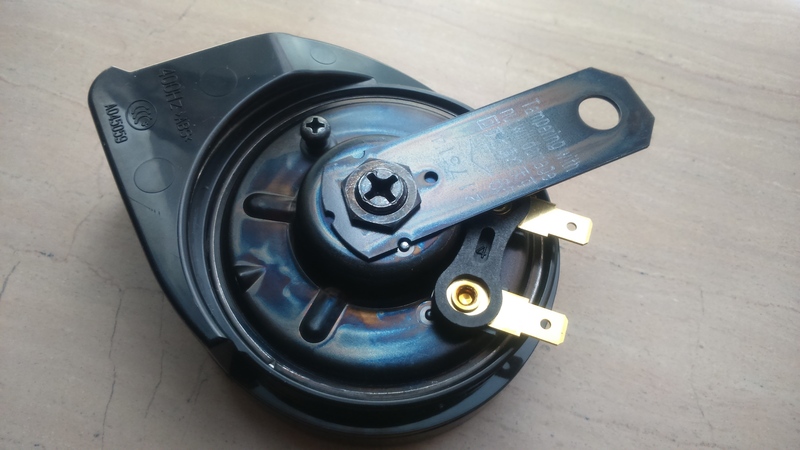 It was a straight replacement for the standard horn, a simple matter of unscrewing and unplugging the OEM one and bolting in the PIAA in the same place and connecting it to the same wires. Current draw is not high, so there was no need to wire in a relay. It made a world of difference, maybe not in volume, but tone was a lot more car-like, so cagers do pay more attention when you sound it. Happy with the product, I decided to get another one for the AT, and this time I was lucky to find a pack including two horns – 400Hz and 500Hz. The idea is that the combination of both frequencies produces a louder, deeper sound. I found the 500Hz one on the Super to be more than enough, but since I found the pack on Ebay for the same price I had paid for a single 500Hz one, I ordered it. The problem came when I tried to find a place to install them in the AT. Space is even more restricted on the Honda, and after trying different combinations, it was clear that the only easy option was to fit only the 500Hz in the same place as the OEM horn. 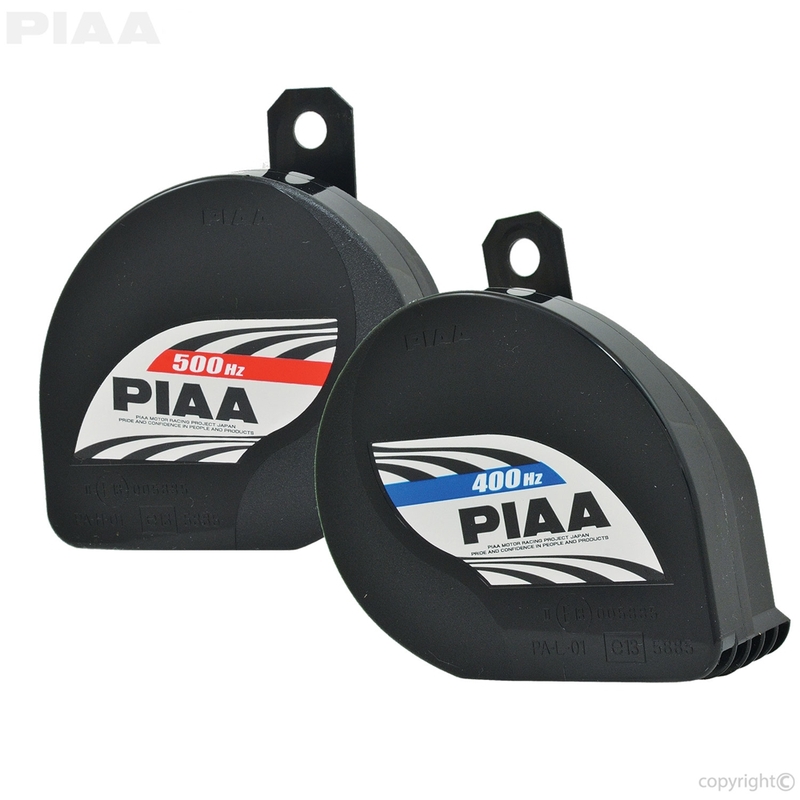 The PIAA is quite compact, but still larger both in diameter and depth than the standard horn, so a couple of little modifications were required to install it properly. First, to make sure it fitted as close as possible to the radiator and the grill was not directly facing the frame, which might have stifled the sound a bit, I rotated the mounting plate of the horn 180 degrees. 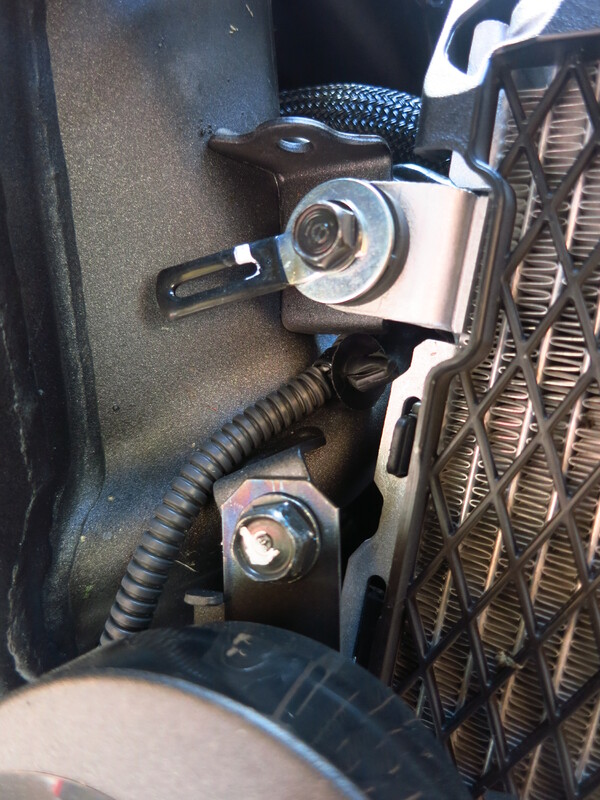 This can easily be done by loosening the bolt that attaches it to the horn and rotating it as desired. Careful though, the nut might be stuck due to the paint, so make sure you hold the horn formly. There is a little etch at the bottom of the plate and four little plastic protuberances to secure it in different positions in increments of 90 degrees. That left the connectors further down that the ones in the original horn, too low for the standard wires to reach them. You can simply buy or make an extension, but it is only a matter of a couple of inches, and a job well done would include covering them in heat-shrink tubing to protect it properly. After a bit of fiddling, I discovered that it was possible to re-route the bike wiring by unclipping it from the mount next to the radiator and then passing it under the mount. It has a heat shield and even in the new position it did not get much closer to the radiator, so there was no risk of damage and now it was possible to connect the horn without further modifications. It is a very tight fit, clear of the bottom of the triple clamps by only a couple of millimetres when in full left lock. I took measurements to ensure that the mudguard would not touch it under compression, and it seems that the only possible situation in which that might happen would be fully bottoming out with the wheel turned right full lock, which is highly unlikely to happen in normal use. I might have been able to install the second horn on the other side if I made a bracket myself to attach it to one of the radiator mounts, but I still have not installed the crash bars and they use those mounting points, as do the radiator protectors I also want to fit. I will wait and see if it is possible once everything is in place. With a draw of 2.7 amps I do not think that a relay is necessary, so all in all it a is a pretty straightforward installation and the gain in safety is considerable. Even the most oblivious mum changing lanes in a monster SUV while sending text messages with one hand and fighting kids in the back seat with another is bound to hear me now. This entry was posted in Equipment and tagged farkles, Honda CRF 1000L, PIAA Powersports Slim Line by Kilian. Bookmark the permalink.